Rancho Cucamonga's Roll-Em-Up Garage Doors has been specializing in Garage Door repairs and installations for over 25 years with Fully-licensed and quality work at affordable prices! SALE starting up on January 4th for Garage Door Spring Repairs! Call today for an absolutely phenomenal Garage Door Spring Repair starting at only $175 with a FOUR YEAR warranty! 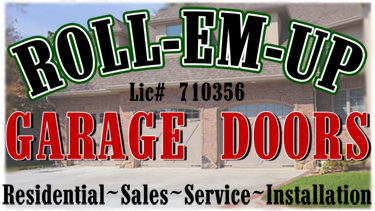 Welcome to the official site of Roll-Em-Up Garage Doors! The Roll-Em-Up Garage Door Installations and Garage Door Repair Company is a family owned & operated garage door business stationed in the heart of Rancho Cucamonga that has been providing professional garage door repair and garage door installation solutions to residential clients in the Greater Inland Empire for over 27 years. Our Rancho Cucamonga Garage Door company easily has the experience to handle garage door projects of any and every size of garage door, be it a Garage Door Installation, Garage Door Repair job, or a simple Garage Door check-up. Our motto is "If we can't fix it, you don't pay" which is what we sincerely stand by for every single Garage Door Repair and/or Garage Door Installation we do. From various garage door repair/garage door installation reviews and feedback we have recieved from more locations than just the Rancho Cucamonga area, we are known for our garage door company's quality workmanship and superior client service, keeping our trust between customers very strong. Call us today and we will work with you to get the perfect Garage Door Repair or Garage Door Installation job you need. We are fully-licensed Garage Door installers from Rancho Cucamonga that can repair and/or install for CHI Overhead Doors, the Door to Quality, and that also specialize in the most complicated of Garage Door Repair procedures. Roll-Em-Up Garage Doors Rancho Cucamonga is a full-service, fully-licensed, and fully-professional Garage Door Installation and Garage Door Torsion Spring and General Repair company operating in Rancho Cucamonga, California. We provide everything from Garage Doors, Garage Door parts, Garage Door springs and Garage Door gates. Roll-Em-Up Garage Doors Rancho Cucamonga offers prompt, reliable, service for all sales, in Garage Door repairs and Garage Door installations. At Roll-Em-Up Garage Doors Rancho Cucamonga, we take the most utmost pride in customer satisfaction and our premium services. We value and appreciate the confidence our customers have in us, and we promise to not let you down with our quick, easy, and same-day Garage Door repair service! As the best Garage Door repair company in the Inland Empire, we promise not to disappoint! Besides installing the best Garage Doors in Rancho Cucamonga, we also provide quality Garage Door Torsion Spring and General Repair for any garage door make and garage door model. Whether the Garage Door Repair for your Garage Door needs new openers or the torsion springs that need to be fixed as soon as possible, we can do it all and maintain the highest quality standards at the most reasonable prices. Our other Garage Door Repair services include Garage Door Panel replacement, Electric operators, and Garage Door Lubricating & Tune-ups. We also offer a line of Garage Door accessories including Remote Controls, Garage Door Key-less entry systems, Backup battery packs and much more! Call us at (909) 476-0288 to discuss any Gates or Garage Door Repair questions or problems you have. Roll-Em-Up Garage Doors is located in Rancho Cucamonga, CA 91730. Don’t let your Garage Door shut you out! Roll-Em-Up Garage Door Repairs and Garage Door Installations Rancho Cucamonga will have your garage operating in no time at all! Call us today!